I earlier posted on how you can now activate your mtn sim for 4Glte services and Activating your Glo sim to Enjoy fast data speed on Glo network but it can be pointless as to you if you are not sure if your device is 4Glte supported device. 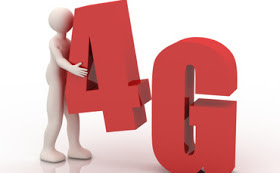 In this post you will determine if your using the device of 4Glte supported or you get a new one. the way things are going it seems to be that we are gradually dropping 3G down to embrace 4G, means the forth generation of data technology for cellular networks while LTE means long term Evolution that offers more high speed network data for mobile phones and other Internet gadgets and devices. The network gives 10 times the speed you get when using 3G network mode. You might be very worried about if really your supports 4G LTE network or not that's why am here to direct and show you if your phone can accept the network or not. Well for me I will say many smartphones users today here in Nigeria (most preferred) are still making use of 3G Internet source to surf the net that is now outdated in many developed countries in the world but as we still move on and 4G is here and new smartphones are been produced and comes with 4G support in Africa, it's just matter of time gradually it will definitely take over. But before then, you should know if your phone is with tandem with others because no one want to be left out even you. So even if you are making use of iphone, Blackberry, Android phone, Windows phone, you can as well check if your phone supports 4G LTE network right here below. Go to settings > Network settings > mobile network. You should see a drop down menu of mobile standards such as 2G, 3G or LTE (4G). If you don't see 4G or LTE, then your smartphone doesn't support the standard. On your iPhone device, go to settings > General>cellular > Enable 4G LTE. On your Windows phone, go to settings >cellular + Sim > highest connection speed and check if LTE is part of the options. Go to settings > network and connection > mobile network >network mode and you will see 4G and 3G and 2G. if you are Q5 and below you will not get 4G network services.